To people who are not involved in the writing life, the idea of poets in a committed relationship can strike a romantic cord. Many acquaintances have suggested that it must be great to have someone at home who understands what it’s like to be a poet: someone who reads closely and provides just the kind of considerate critique needed to revise and edit toward the perfect poem; someone who will contradict every rejection and celebrate every great (or mediocre) publication; and someone who, above all else, provides love and support when the rest of the writing world seems to have turned its back. Since writers in love seem to hold a great deal of mystery for writers and non-writers alike, we thought we’d explore some of the more common assumptions that we’ve encountered during our 10+ year relationship. Lisa: Though we discuss favorite poets and books, craft, and theory as well as keep each other informed about markets we’ve submitted our work to, we probably talk about the business of poetry more than anything. By that I mean that a lot of our “poetry conversation” is peppered with academics, especially since we are both teachers, and we tend to discuss the latest gossip about who won the latest award or who was hired at what institution for which position. Honestly, because we talk about writing at our jobs everyday then spend our evenings writing and researching markets, we tend not to talk about writing and academics in our down time and prefer to focus on some of the simpler joys of life and marriage, like what albums to buy on Record Store Day or what movie to see on date night. With that said, I have to admit that far more of our time is probably spent deciding what we are going to have for dinner. Gary: If we’re considering poetry a (part-time) career, then I don’t think we talk about poetry any more than two people who talk about working in the same field. But it’s more than a career too, right? I mean it’s a passion, and it’s a passion we share, but for me poetry has always been this type of paradoxical experience – it requires solitude, yet the goal is communal – to reach out. So though we share and talk about poems – our own and other authors/books we adore, we don’t usually engage in these long, passionate, critical discussions. Every once in a while, sure, but we’re more likely to say “you check out that Natalie Diaz poem on poem-a-day? It’s pretty dope. It reminds me of…” and then we move on to talking about dinner, who needs the car and when, what we need to buy at the store, what’s on TV. Similar to what Lisa already said, our lives at this point could entirely revolve around poetry if we allowed it, and who wants to be identified by a single passion? To riff on Carver, This is what we talk about when we talk about poetry. Lisa: When it comes to sharing my work, I don’t necessarily want my spouse to weigh in on every piece of writing I compose. I rather believe it’s healthier for our writing, and our relationship, to keep our respective voices distinct and relatively unadulterated by the other’s opinions. I rely more on my own instincts these days, which will sometimes tell me consult an outside reader, one that I am NOT married to. When it comes to editing, I do often ask Gary to read something before submitting. This generally works fine unless I am overly attached to what I have written and therefore less receptive to his comments. As a result, we might get snappy with each other and wind up sulking in our offices, and honestly, I can think of about a million other things I’d rather do with my husband than sulk. Gary: Ha! Is convenient the right word? We haven’t work-shopped or edited each other’s poems in a long time. We’ll help edit each other’s documents, letters, and other pieces (like this blog post for example), but going back to the idea finding solace in the solitude of writing: we tend to only show one another poems just to get a general sense of a yay or nay if we’re feeling a little unsure (or super excited about a newborn poem). It seems to work best for us that way. Too many cooks in the kitchen and all that jazz. And yes, two can be too many cooks. Lisa: I am fortunate to have a room of my own. One with a desk, lots of books, a window that opens and a door that shuts. There is a bed, too, so the space can double as a spare bedroom for guests, or as a great spot to read and take a nap. Still, when I am stuck or bored with my work, feeling lonely, or have a random question about our plans to fly home or some other trivial matter, I am sorry to admit that I will barge in on Gary on occasion. I could, perhaps, claim to have picked this habit up from him, but I suppose I should just admit to my flawed behavior. I also have to admit that his interruptions are, sometimes, quite a welcome distraction from my work. When it comes down to it, though, we respect each other’s space when we know the other is working on a big project. Gary: I think it’s essential for a couple to have separate workspaces, and we’ve been fortunate enough to live in places with space for separate offices, otherwise it gets more difficult to respect that writing space – when your writing space is, let’s say, the living room coffee table. Though you do what you gotta do when you don’t have the luxury of space (and we’ve been there before too). And yeah, I’ll take that blame for encouraging Lisa to barge in on me. And I do it way more to her than she does to me. Lisa: Our relationship is built on many commonalities. We met in undergrad where we attended many of the same classes, writing circles, readings, and, eventually, parties. We discovered we shared interests in comic books, though I am far less zealous, as well as movies, art, and music. In areas where our tastes diverge, we enjoy introducing each other to new things we may not learn about otherwise. We have many separate interests, too. Gary, for example, likes playing video games where I prefer to do just about anything else. Likewise, Gary isn’t too interested in knitting, sewing, painting, or yoga. Where I like a quiet house, he prefers the hum of the television or, occasionally, music. Where I like salad, he prefers red meat, grilled if possible. I guess our biggest differences are gender and skin color, which I rather consider complimentary. Gary: Ditto to everything Lisa said. For once, I got nothing to add! Lisa: The first poem I ever published was about an evening Gary and I spent together when we first started seeing each other and, recently, I wrote a poem based on something he did. Of course, I take a lot of poetic license when I write about anything in my life, including my marriage, and what suites the poem will prevail even if it isn’t factual truth. It’s emotional truth that I am after. Gary: Of course, but it’s not as titillating as you may think. And like all poetry, when you read those poems – know that everything is true and nothing is true. We don’t ask permission either, we just trust each other enough to realize it was something potentially upsetting, we’d give each other a heads-up first, and more importantly – I don’t know if there’s anything we could write about the other that could even be potentially upsetting! 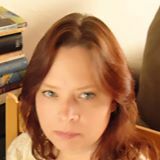 Lisa Hase-Jackson holds a Master’s in English from Kansas State University and is an MFA candidate at Converse College in Spartanburg, SC. Her current projects include an anthology of poems celebrating New Mexico’s 2012 centennial and a manuscript of her own poetry. Her poems have appeared in Sugar Mule, Kansas City Voices, Pilgrimage and elsewhere. She teaches English and Poetry at the College of Charleston in Charleston, SC, and is the Review Editor for South 85 Journal. 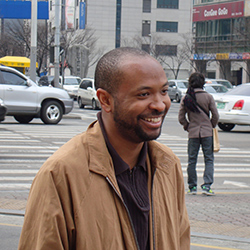 Born and raised in Topeka, Kansas, Gary Jackson is the author of the poetry collection Missing You, Metropolis, which received the 2009 Cave Canem Poetry Prize. His poems have appeared in Callaloo, Tin House, Tuesday, and elsewhere. He is the Associate Poetry Editor at Crazyhorse, and an Assistant Professor at the College of Charleston in Charleston, SC.